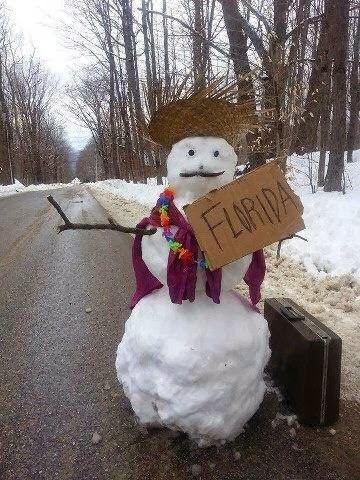 We do, but I hope this brings a smile to my friends up north! I live in the Gulf Coast region of Texas. It isn't too often that we see the kinds of temperatures that we are expecting in the next few days. Snow is a rarity, almost nonexistent in my part of Texas. Every year we'll have a few nights that drop into the 30's. We will be advised to cover our plants and wrap our pipes. But that's it. I've been watching all the winter advisories for our friends up north. 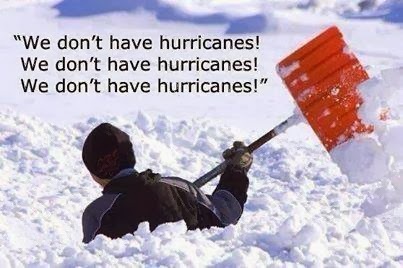 I've seen pictures of the snow and destruction, heard about power outages. My family and I started gathering our citrus fruits to juice and preserve the best we can, but that seems so insignificant compared to what some of our friends are experiencing. I suppose what I'm getting at is that my thoughts are with those going through really tough times with their weather. I'm shocked and worried about the -50 and -60 degrees they are expecting way up north. Keep safe and warm with your family and pets. Here's a pic I've seen floating around. Sums up a lot.